ArmInfo. 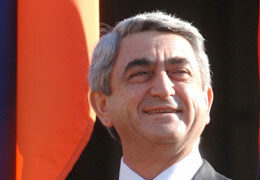 Committed to his recent promise, Armenian President Serzh Sargsyan has started forming a so-called "government of national accord". ArmInfo has been told by a source close to the authorities that for that purpose Karen Karapetyan, ex- mayor of Yerevan, Deputy CEO for Strategic Development at Gazprom Mezhregiongaz, has already been invited to Yerevan. According to the same source, the Armenian President is going to offer Karapetyan to head the "government of national accord". The source does not specify what the incumbent prime minister will be doing in that case. The ministerial office will also undergo some changes. For instance, Head of the Armenian President's Staff Vigen Sargsyan will be appointed foreign minister, and the incumbent Foreign Minister Edward Nalbandian will be sent to France as an ambassador. It is not ruled out that National Security Council Secretary Armen Gevorgyan will replace Vigen Sargsyan as the head of the President's Staff. In that case, the Security Council will become part of the President's Administration. According to the source, Head of the Customs Service Hovik Hovsepyan may be dismissed in the near future. The former Prosecutor General, Gevorg Kostanyan, will replace Yuri Vardanyan as Armenia's Ambassador to Georgia. Acting Prosecutor General Armen Harutyunyan's nominee will be advanced for the prosecutor general's post.